Multiple Grade 1-winning millionaire Mor Spirit, who's best known for his dominant victory in the 2017 Grade 1 Metropolitan Handicap, has been retired and will stand stud in 2019 at B. Wayne Hughes' Spendthrift Farm in Lexington, Ky.
Mor Spirit is the newest stallion to be offered through Spendthrift's renowned Share The Upside program. His Share The Upside fee will be $10,000 stands & nurses on a one-year commitment, and breeders will earn a lifetime breeding right in Mor Spirit after producing just one live foal in 2020. He will also be offered for $10,000 on a standard stands-and-nurses contract. On the track, Mor Spirit broke his maiden as a 2-year-old by 4 ¼ lengths at Santa Anita, earning a 92 Beyer. He went on to capture the G1 Los Alamitos Futurity to close out his juvenile campaign as a Grade 1 winner. Mor Spirit opened up his 3-year-old season where he left off, winning the G3 Robert B. Lewis Stakes at Santa Anita. He was also runner-up in the G1 Santa Anita Derby and G2 San Felipe Stakes at three. As a 4-year-old, Mor Spirit went on a three-race win streak and established himself as one of racing's best milers. He shipped to Oaklawn first to win the Essex H. by 2 ½ lengths, earning a 108 Beyer. Mor Spirit went back on the road to capture the G3 Steve Sexton Mile by 5 ¾ lengths at Lone Star, earning a 107 Beyer. Those performances made him the favorite for the prestigious Metropolitan Handicap at Belmont. 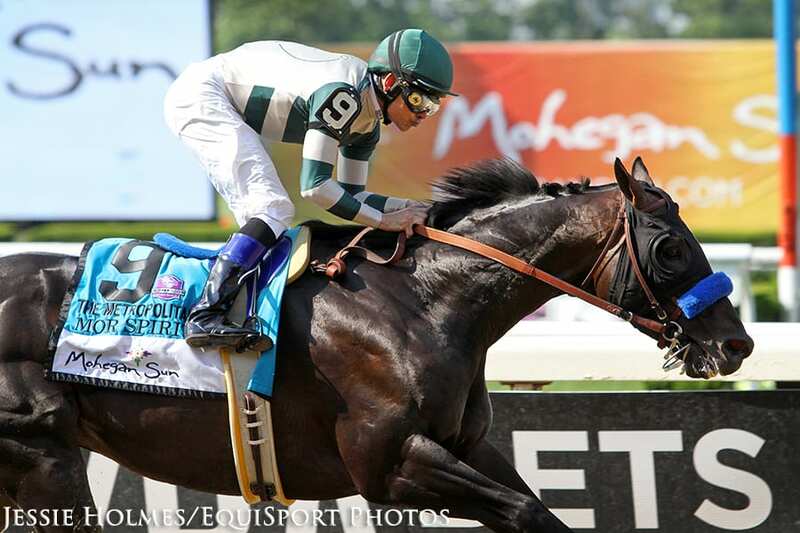 In what was widely regarded as one of the best performances of 2017, Mor Spirit dazzled in the Met Mile, drawing away from Grade 1 winner Sharp Azteca and an elite field of milers to win by 6 ¼ lengths in dominating fashion. Mor Spirit stopped the clock in 1:33.71 for the mile, earning a 117 Beyer and negative 1 ¼ on the Ragozin sheets. The 117 Beyer marked the fastest up to a mile in 2017, and only Arrogate was faster overall on the year. With the victory, Mor Spirit became the first Grade 1-winning juvenile to go on and capture the Met Mile since Holy Bull in 1994. A $650,000 2-year-old purchase, Mor Spirit retires with earnings of $1,668,400 for owner Michael Lund Petersen and trainer Bob Baffert, finishing first or second in 11 of 14 career starts. The multiple Grade 1-winning millionaire retires to Spendthrift as the most accomplished son of the brilliant Eskendereya. He hails from the multiple stakes-winning Dixie Union mare, Im a Dixie Girl. This entry was posted in Bloodstock, NL Article and tagged Bob Baffert, Met Mile, michael lund petersen, mor spirit, Sendthrift Farm, share the upside by Press Release. Bookmark the permalink.